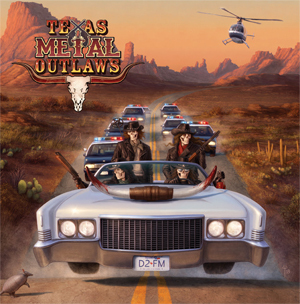 Texas Metal Underground (TMU) Records has announced the upcoming release of TEXAS METAL OUTLAWS, an all-star project that keeps one foot in the past while making a huge leap into the future of killer Texas metal. Four years in the making, Texas Metal Outlaws features a stable of musicians instantly familiar to any true fan of the classic Texas scene. Masterminded by IGNITOR/WITCHES MARK guitarist Robert Williams, the full-length LP features performances by Jason McMaster (WATCHTOWER, DANGEROUS TOYS, BROKEN TEETH), Mike Soliz (MILITIA, ASSAILANT), Stuart Laurence (IGNITOR, AGONY COLUMN), Donnie Van Stavern (S.A. SLAYER, RIOT), James Rivera (HELSTAR), Larry Barragan (HELSTAR), Al Berlanga (SYRUS), Mark Zamarron (LAS CRUCES), Felix Griffin (D.R.I. ), and a host of other surprises. Presented on translucent ‘Orange Crush’ vinyl and highly limited splatter vinyl, look for the album to be released in early Fall 2018. The primary mission and goal of TMU Records is to preserve and resurrect lost and unheard classic metal gems from the 1980’s underground Texas metal revolution on vinyl, cd and cassette. The label aims to inform the world of some of the great bands who wrote original songs, played a few gigs, maybe recorded a demo, and disappeared without a trace. Bands that may have slipped through the cracks of popularity and notoriety, but who nevertheless deserve a place in the tomes of Texas metal history. Regardless of format, all TMU Records releases are given lavish treatment with custom packaging, unseen photos, show flyers, interviews, informative booklets, rare bonus tracks and extras for the denim and leather die-hards.